Locality have been working with six local authorities to halt the trend towards outsourcing services at scale to multi-national companies. Outsourcing not only leads to poor quality services, it also means scarce public resources are leaking out of hard-pressed local economies. This report shows how councils can ensure the billions of pounds they spend each year on services has maximum community benefit. 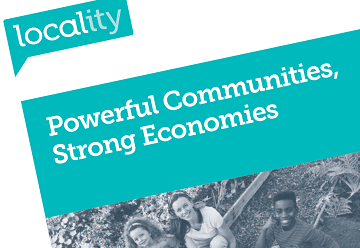 The report includes action research, supported by Friends Provident Foundation, that highlights the contribution community organisations make to the local economy – by employing local people, using local supply chains, and providing spaces for small businesses and social enterprises to prosper. For example, an analysis conducted by NEF Consulting found that 10 Locality members collectively enabled approximately 1,400 jobs and approximately £120m of gross value added to the local economy through their tenant organisations.